The ground floor in No 4 comprises a fitted kitchen with a dining area and a cosy open plan sitting room with an enclosed wood-burning fire and views across the canal. Upstairs there are 2 bedrooms and 1 shower room with power shower. One well behaved dog is allowed in the cottage living area but only under responsible supervision and by prior arrangement. Crinan Canal Cottage(s) do not charge for dogs - who are most welcome - together with their responsible people. 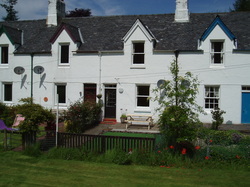 Both cottages have free Broadband (fibre-optic) and free Wi-fi. The private front garden at Crinan Canal Cottage No 4 shown here has a patio on which during the summer months there is a table/bench for dining out - weather permitting. The front garden is in fact Astro Turf, with two golf holes - putter and practice soft golf balls provided. ​There is a bike and wood store in the lane at the rear of the property.